One of Britain's most under rated bands ever. Things had begun to look up for The Wildhearts after 'P.H.U.Q. ', with that album going straight into the top ten in the UK and a tour supporting AC/DC around Europe also being a huge success. However with the band's label East West continuing to upset the band at every move, most noticeably by releasing albums of material that were unsanctioned by the band, the chance to continue that tour across America was scuppered after only a few dates when Ginger and the boys finally got their wish and parted from their label. A new deal was quickly inked with Mushroom Records (outside East West's offices!) and the band set about recording a new album. That said, on a personal level, if the cracks had started to appear during the recording of 'P.H.U.Q. ', then by the time that 1997's 'Endless Nameless' arrived they were gaping wounds. The previously unknown Jeff Streatfield had arrived to fill the vacant guitar position, but by the time he clocked in, it was just as important to Ginger, Danny and Ritch to find someone who could keep up with their drinking and drug taking, as it was to find a talented musician. That's not meant in any way to detract from Streatfield's six string ability, but with what can at best be described as a "challenging" sound on the resultant album, whether Jeff was an axe slinger extraordinaire quickly became a moot point. Mushroom Records were happy enough when The Wildhearts announced that they intended to take their sound into an altogether heavier direction, but nobody could have envisioned the overly distorted, almost white noise and metallic clanging drum beats that buried the songs. With hindsight the band have admitted that this was mostly down to substance abuse clouding their judgement, but in their defence producer Ralph Jezzard (EMF/Senseless Things) has to take more than his fair share of the blame and Mushroom did approve what the band were doing. Most of the songs are of a high standard with 'Norse Maximum', 'Urge', 'Anthem' and 'Pissjoy' standing out, the problem is that they are held hostage by the harshness of the sound. Unfortunately even after all these years, this album is still a tough listening experience and one that for newcomers to the band will make 'Endless Nameless' hard to get through in one sitting. 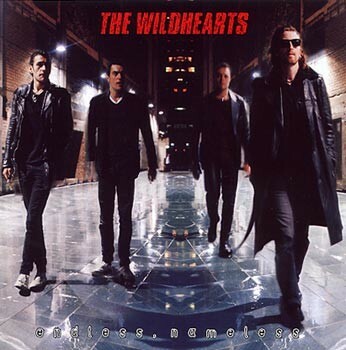 The Wildhearts would go on a four year hiatus after this album and in truth during that time there seemed little likelihood that they would ever return. The bonus disc for this album groups together the ten songs that were released on the various guises of the 'Urge' and 'Anthem' singles, with 'So Good To Be Back Home', 'He's A Whore' and 'Zomboid' all impressing, but as with the main album all the songs suffer from the same dense wall of noise hiding any glimpse of a melody. Of the four Wildhearts reissues that Lemon Recordings have released, 'Endless Nameless' is the only one that I would approach with caution, with the other three being amongst my favourite albums of all time. The reissues themselves are of the highest order, with great liner notes from the likes of Dave Ling and Jerry Ewing (both of Classic Rock) making for a great potted history of the band and the addition of some hard to come by bonus tracks across the four discs not only adding value for money, but making these interesting purchases for long time fans of The Wildhearts and those keen to explore one of Britain's most under rated bands ever.